NORMAN (2) was built in 1894 by Harland & Wolff at Belfast with a tonnage of 7537grt, a length of 507ft, a beam of 53ft 2in and a service speed of 17.5 knots. 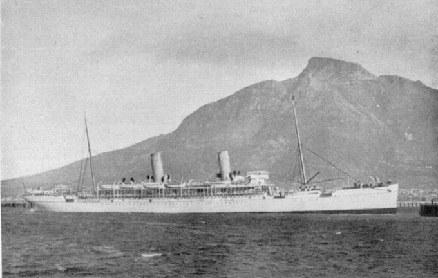 She was the first of many ships built by Harland & Wolff for Union-Castle and, at the time, the largest ship on the Cape Town mail run. 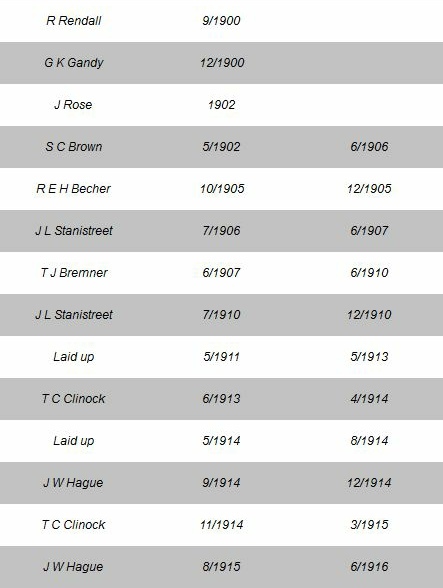 In 1895, she grounded near Port Shepstone with slight damage, and the master (Capt W Bainbridge) was stripped of his command. She was built to Admiralty troopship specifications and was requisition for use during the Boer War in November 1899. In 1900 she was transferred to Union-Castle following the merge whilst still on troopship duties. She was refitted in 1904 and subsequently worked as a mail ship until 1910 when, after being replaced by the Balmoral Castle, she was laid up at Netley in Southampton Water. At the outbreak of the First World War in 1914 she was recommissioned as a troopship for a short while before reverting to the mail run. During this time she was part of the first convoy to take men of the British Expeditionary Force to France. 1918 saw her on troopship duties again, this time in the Mediterranean.. 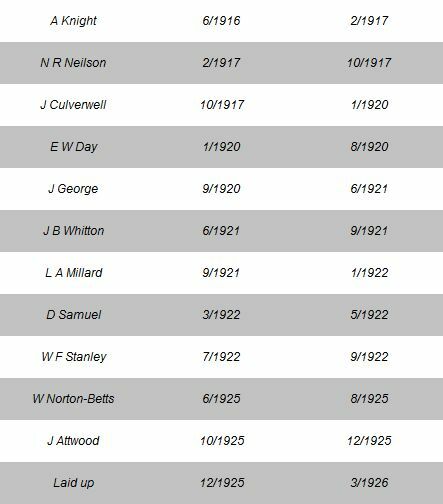 In May 1919 she was chartered to P&O for one voyage to Australia before returning to the mail run. On 10 June 1907 the Eastern Province Herald reported that an unusual mail delivery had been made at sea on 25 April when the RMS Norman overtook the Union Castle SS Galeka in mid-Atlantic and dropped a barrel overboard containing letters for the latter's passengers. 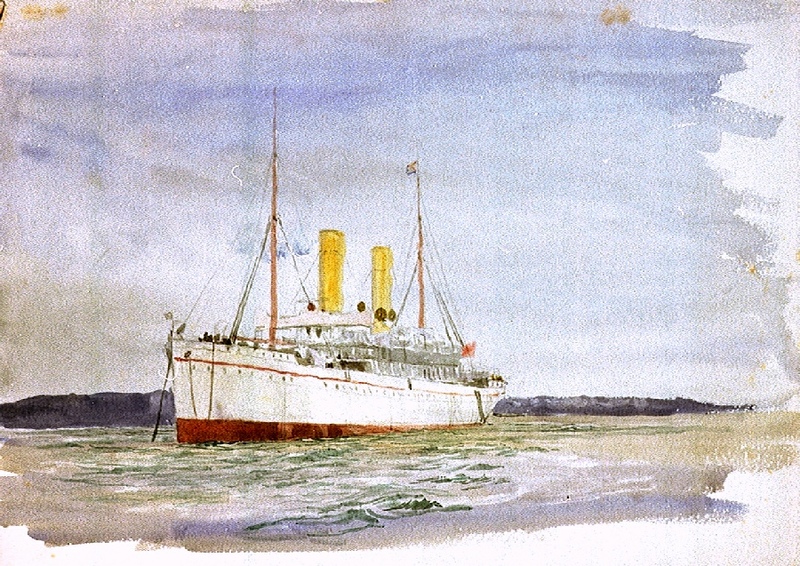 The innovation is said to have been appreciated by the passengers of the two boats who interchanged cheers while the Norman's band played "Auld Lang Syne"
She was replaced by the Arundel Castle in 1921 and transferred to the intermediate service and in 1923 she was deployed on the Round Africa service, out via Suez and home via the Cape. In 1925 she was replaced by the Llandovery Castle on the Round Africa service, laid up in the River Blackwater off Tollesbury and broken up in 1926. 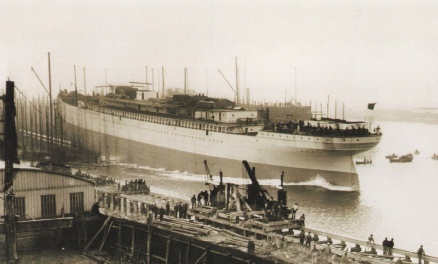 A NEW STEAMSHIP: THE NORMAN. Every addition to British steamers is of interest to those who have had experience of travelling by them — as who has not? — and to those who look forward to such a pleasure. 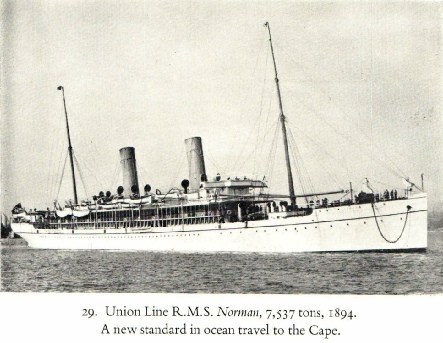 Just lately the Union Steamship Company has added the Norman to its already important fleet, and it is now making its first voyage to South Africa, having started on Nov. 10. Both at Belfast and Southampton large numbers of guests have had an opportunity of testing the capabilities of the new steamship. She was built by Messrs. Harland and Wolff, the famous Belfast firm, and is the largest of the Union fleet, as is appropriate to a vessel which hails from the largest works of their kind in the world. From beginning to end everything connected with a first-class liner is made by Messrs. Harland and Wolff, if one excepts the pretty stained-glass employed in some of the windows, The Norman is 490 ft. in length between perpendiculars, 53 ft. broad, and 373 ft. deep; her gross tonnage is 7392. She is fitted with two sets of triple-expansion engines, capable of developing 7000-horse power. It may be mentioned that one-tenth of the iron steamship tonnage of the United Kingdom is now turned out from the yard of Messrs. Hariand and Wolff, who can proudly claim to employ 8000 hands. At the banquet given at Belfast a good deal of mention was made of the development of trade in connection with South Africa, and probably the Union Steamship Company will have to add very soon successors to the Norman. 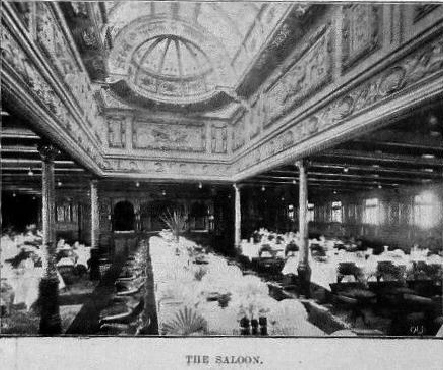 The main saloon is specially handsome: it is panelled in light wainscot-oak, and the electric light shows off all the tasteful decoration of the room to great advantage. The library is another handsome apartment, furnished with Chippendale mahogany, and surmounted with a dome of stained-glass in satin-wood framework. On its electric-blue seats the passenger who could not find rest and refreshment reading one of the books from its well-stacked library would indeed be hard to please. 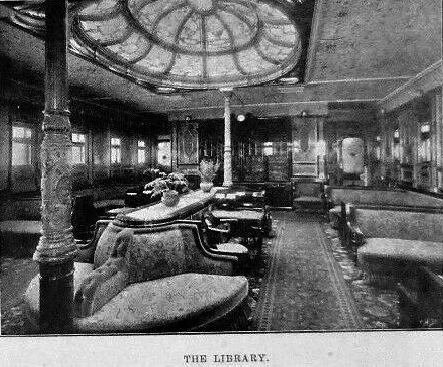 A special feature in connection with the drawing-room and library is the complete set of refrigerating apparatus, which cannot fail to be a comfort and an aid to health in passing through the Tropics. Then one must sing the praises of the smoke-room, admirably adapted to the delight and satisfaction of every devotee of "My Lady Nicotine.” Electricity supplies that very constant necessity, a match, by furnishing an incandescent glow from the pressure of a button, which effectively does the work without the slightest risk of setting fire to the room. There are three promenade decks on the Norman, two of which are entirely free from any boats or working-gear which might impede the walker. They run nearly the whole length of the ship. and each of them is protected from the sometimes stormy elements by the planks of the deck above. So that he or she who is ordered by the physician to have as much walking exercise as possible can become amateur Westons in pedestrianism en route for the Cape. The command of the Norman has been placed in the hands of Captain Bainbridge, who is the senior captain of the Union Steamship Company. A special train, on the London and South Western Railway, conveyed about three hundred ladies and gentlemen to Southampton Docks, where they embarked on board the Norman and enjoyed a trial trip in the Solent, during which the Norman steamed from fifteen to seventeen knots. On the occasion of a second trip the London visitors included a large number of leading merchants, whose business connections lead them to take a special interest in South Africa, At the luncheon, which was served on board, presided over by Mr. Alfred Giles, the Chairman of the Company, the Chairman mentioned that, whereas the Union Steamship Company was only capable of carrying five hundred passengers a year in 1857, it was now capable of accommodating 30,000 passengers a year. Mr. Giles, who formerly represented Southampton in Parliament, also spoke of the success which had attended that port since its connection with the South African liners. Anyone who has witnessed the crowds assembling at Waterloo Station to journey by special train to Southampton, and thence to the Cape, will endorse Mr. Giles’s statement as to the popularity of the London and South Western Railway Company. Mr. Rhodes’s arrival in this country will probably result in still more attention being paid to South Africa as a hopeful and healthy resort for emigrants. Several other interesting comparisons between the past and the present were made by subsequent speakers, and, as to the future, we can only conclude with hearty congratulations to the company on their latest achievement, and best wishes for success in the future, which so vitally affects the commerce of the world and the strengthening of that “crimson thread of kinship,” which it behoves all statesmen to regard.